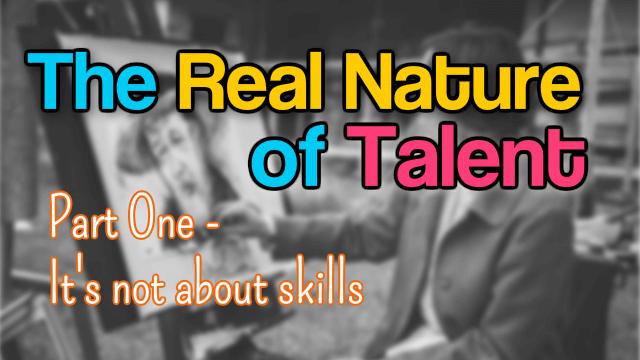 The real nature of Talent – part 1 – and it’s not skills! The goal of these articles is to clearly define what a talent is, to get out of the mystic or romantic speech about talent and how to assess those talents. We read things like talents are innate, natural. Believing it’s innate -a God gift- brings some kind of natural mystic. But … it doesn’t say much. Talking about talents often leads as well to “artistic” related conversations. This doesn’t say much... and bringing back to the corporate world, it's quite difficult to relate. Honestly, to me, you can believe it’s innate or acquired… it doesn’t shock me. From my perspective, I prefer to believe it’s both of possibilities. I don’t like the idea that people are stuck forever in “what has been given to them at birth” with no perspective of evolution. But these considerations still don’t give us a clue about the nature of talent! A talent is a particular MIND ABILITY! Please note that I’m using the word “ability” and not “skill”. Using the word “skill” could be confusing. A skill comes from the combination of knowledge + practice. It can become really powerful when it’s based on one or several talents, supported by a purpose and a passion. But the purpose of this equation proposition is just to give you a rough idea. About the author, Xavier helps companies with their international development and expatriate individuals in different ways but based on their intrinsic Human Success Factors.